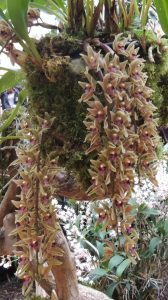 Another plant that was very admired at London was this gorgeous Cymbidium species. Cymbidium devonianum is a beautiful smaller growing species with wide leathery leaves and pendulous spikes of densely packed spikes of green and pink flowers. In Sikkim we have found this species growing in heavy shade, low in trees and usually in pockets of detritus and dead leaves that keeps the plant damp through the dry season. In cultivation we replicate the cool, wet shady conditions it enjoys and too much light or too little water results in brown tips to the thick leaves. We grow plants in baskets to allow the pendulous flower spikes to emerge and not become trapped in the bottom of a pot.